This is Lilly. Another girl with a wonderful nature, and a great Mum. Lilly is half Shetland. 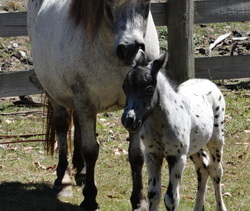 Filly - Buckskin Appaloosa "Ridgewood Talikas Moccachino"
Filly - Black Snowflake Appaloosa "Westforks Ebony Illusion"
2010 Colt - Brown Appaloosa "Half Pints Ultimate Big Chill"
2012 (January) Colt - Black Fewspot Appaloosa "Half Pints Pepe Le Pew"
2013 (January) Colt - Black Leopard "Half Pints Arctic Moon Leopard"